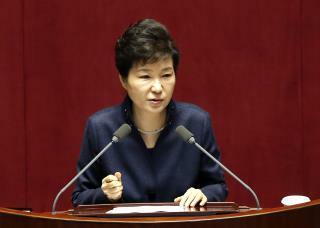 (Newser) – The impeachment of South Korean President Park Geun-hye, and the scandal surrounding it, all comes down to a canine. Park's downfall started over ties with Choi Soon-sil, a close friend for decades embroiled in criminal controversies and secretly advising Park—and who got into an argument with the eventual whistleblower over her daughter's pup, the New York Times reports. Ko Young-tae relayed his story at a parliamentary hearing last week, noting he and Choi got into a tiff after she discovered the dog, which he'd been asked to walk, alone in his apartment while he was out golfing. He says that after they exchanged words, he decided to come forward with what he knew about Choi and Park. Ko, 40, an ex-member of the nation's fencing team and called Choi's "boy toy," had worked at a Seoul "host bar," where male workers entertain female customers with conversation and sexual services. When a self entitled male prostitute becomes a national hero, you really got wonder is South Korea the best Korea? Whistleblower in Park Geun-hye case says her secret adviser fought with him over dog" - so were they going to eat it?